While I greatly enjoy cooking quick and simple dinners on an everyday basis, having a few meals stashed away in the freezer is like having money in the bank. I have a week-long conference at work starting tomorrow, which will mean long and tiring days, so I wanted to get ahead of the game and stock the freezer with a few meals. A dear friend happily agreed to cook with me and split the loot- so we had a freezer cooking date last weekend. This was the first time I cooked specifically to stock the freezer. A surprising array of recipes are good freezer candidates so there's a lot to choose from. A few years ago, I wrote this post and got many helpful suggestions in the comments. This time, we made these 4 recipes. 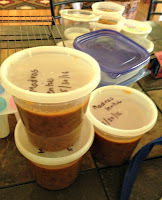 Before meeting up in my kitchen, we each gathered containers for freezing, and rounded up ingredients for two recipes each. Mac and cheese- We doubled Martha Stewart's recipe and followed the recipe quite closely, while cutting down quite a bit on the quantity of cheese. The food processor made it a snap to grate all of that cheese in seconds. The rest of the recipe came together quickly and boy, did it make a huge pot of mac and cheese. We did not bake it- simply divided the pasta and sauce mixture into several baking dishes, topped with the breadcrumbs and covered the dishes with foil, to be baked just before eating. Already this week I cooked up one of the pans of frozen mac and cheese. It went straight from freezer to preheated oven, the broiler got the top nice and browned once the baking was done, and the mac and cheese was pretty much perfect. I'll definitely be doing this again. Madras lentils: We made a double batch of this recipe. Because the pressure cooker was going to be in heavy use for our cooking session (and I only have one pressure cooker), I did soak and cook kidney beans and lentils and have them ready the day before. So this recipe consisted of simply sautéing and grinding the tomato-onion masala and simmering it with the cooked beans/lentils, then cooling the curry and portioning into containers. I plan to pull this out from freezer to fridge a day before we plan to eat it, then reheat in the microwave in a glass container. Mexican style Rice & Beans- No recipe here, and it would probably be a stretch to call this Mexican anyway. I made about 3 cups of yellow rice- sautéing the rice in olive oil on the stove top until toasty, with some salt, garlic and turmeric for flavor and color, then cooking in the rice cooker. The bean stew was simply soaked pinto beans cooked in the pressure cooker with onions, peppers, tomatoes and spices. All in all, it took us about 2 and a half hours for cooking and clean up. This included the time needed to deal with the kids' shenanigans. My friend's daughter and Lila are great friends and play well together. Well, that morning they raced around the house, knocking over and shattering a lamp (thankfully, no one was hurt except the lamp), and found a container of baby talc and liberally sprinkled it all over every square inch of Lila's room. At crucial cooking moments, like when I was stirring the roux and trying not to burn it, I would hear a shriek and a crash. All in a day's play, I guess! The cooking session was hard work but we did have several tasty meals to show for it, neatly portioned and labeled and stacked in the freezer. I don't see myself ever doing the once a month freezer cooking thing (where you cook 30 days worth of meals in one day and freeze them away) but it certainly makes sense to stash away freezer meals when you're anticipating a busy time. 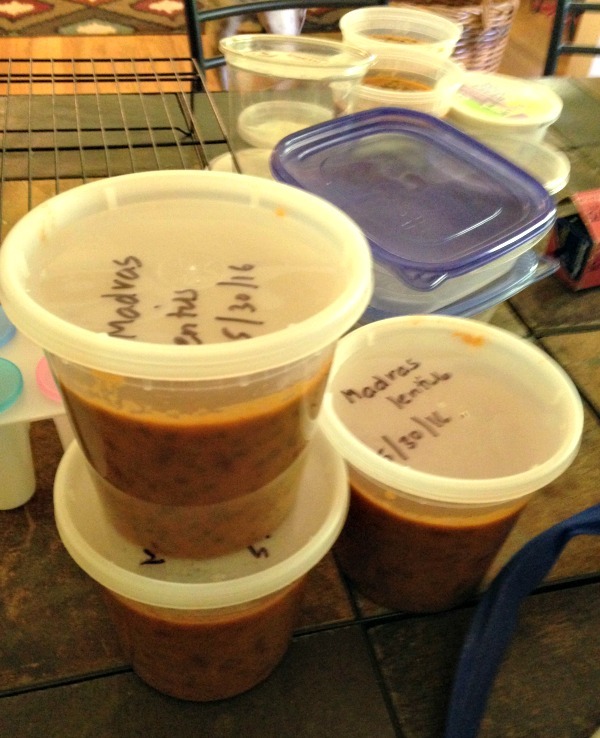 Last year, when I was away working in Kenya for a few weeks, I stocked the freezer with many meals for V and Lila and they appreciated it very much- they requested everything from broccoli cheese soup to pav bhaji, rajma and I forget what else. Certainly the most painless way to stock the freezer with prepared meals is to double recipes on a regular basis (when you're cooking something anyway) and freeze away one half for another time- cook once, eat twice. I should try and do more of that. Do you rely on the freezer for quick meals? What are your favorite freezer-friendly recipes? When we were in US, I used to stash cut vegetables coated with seasoning in the freezer. So on busy nights, just put them on baking sheet and roast them. Also, vegetable stock used to be a common freezer staple. Nothing much apart from that. Now in India, I rarely use the freezer. Just for ice cream and storing nuts as they go rancid so quickly here. I freeze quite a bit, starting about three years ago when a major illness began. I wanted the family to still have access to healthy home cooked meals while I tried to recover and it continues to still work out very well that way. I main freeze prepped ingredients to make meals out of. For e.g. lots of dabbas of soaked, sprouted and cooked beans/legumes like green mung beans, rajma, chana etc. Also, soaked and cooked dals so later I can give tadka and add vegetables etc when I need to. Another thing that helps me is freezing one/two meal's worth of grains like brown rice, bulgur, millet etc. The only thing I seem to make from scratch these days is the veggies. I feel they get two mushy and tasteless if I cooked and froze them. I loved your idea of the mac n cheese though because it's my kiddo's absolute favorite dish and would be wonderful to have on hand for Friday night dinners. Deepa- Like you, I find it very convenient to freeze cooked grains and cooked dals. Good for you for scheduling a couple of days to get a bunch of prep work done! The mac and cheese is definitely freezer friendly and can even be frozen in 1-serving or 2-serving containers if you want a quick meal for your kid. I have frozen a few meals for M, before I go. So I have Masoor Amti (IFR), Idli (which he will have to eat with molgha podi), unless sambar can be frozen. I'm not sure. Have you tried that? I'll make some Mac N Cheese too, but i'm not sure he will bake it and I'm not sure I trust him to do it. I have a big bag of cheese left from the party and need to use it up. Yup, I have frozen sambar before and it worked just fine. All dals and such seem to take well to freezing. By the way, I've also frozen cheese! You could freeze the cheese instead of having to use it up right now. Nupur, have you tried using those tin foil pans ( with covers) for freezing purpose? Those can be used in the oven and I was wondering if that might be a good option for me. Hi Manasi- No, I don't use those because they are disposable and I prefer to use reusable pans. I do have several cake pans and loaf pans and those are what I like to use. Hi Nupur, what containers do you use for freezing? I have been looking around for some good freezer friendly containers. I use whatever I have on hand. Take out containers, yogurt containers, plastic food storage boxes (tupperware/ziploc types), mason jars- all sorts of things. Hi Nupur, This doesn't count as a meal, but definitely a yummy snack that can be stashed in the freezer. The collard greens wadis (alu wadi kind) that you'd posted some time ago. They've been a super hit with my family and I keep a roll or two stashed away in the freezer once they've been steamed. They've been a great way to add some zing to those "varan-bhaat" days! Will definitely try freezing the mac and cheese next! I've been doing that as well, Pal! They freeze beautifully and frying up a few at a time is just so easy. This is a very helpful post.Nothing beats like having frozen home cooked meals esp. for weekdays dinner :-) I freeze dals, soups, stews, pasta sauce, potstickers, curries or curry bases (when I've to cook for parties etc), burger patties I make at home like quinoa/blackbean etc and boiled lentils chana, rajma beans etc.I put the beans (soaked overnight, boiled and stashed away) for quick chole or rajma curries etc. This has helped us save $$$ and eat healthy. Great ideas, Meena! Lots of pasta dishes and Mexican dishes freeze well, it is so nice to be able to cook once and get a few meals out of it. I just wrote a post on my personal rambling blog about cooking ahead and freezing curries/ dal when I know I will be alone with the husband travelling. I try to rid myself of all kitchen chores to do nothing :). I usually have stuff like cutlets/ patties, and 1-2 dal or curries when I make too much intentionally or unintentionally. They're great when you have a packed day or not in the mood to cook. My biggest kitchen help is making and mostly sticking to a weekly menu and doing the prep and chopping at the start of the week, sometimes it includes boiling and freezing dal/ gravies. Arundati- That's a great idea to cook and freeze ahead so you can take a break from cooking when you're eating on your own! Writing a weekly menu is a wonderful habit too- for some reason, I tend to be unable to plan menus for more than a couple days at a time. Hi, frequent visitor to your blog but sorry for not commenting - I love your blog. Whenever I go to India I freeze a lot of stuff for my husband - rajma, chole, and recently discovered baghaira baingan ( eggplant cooked in gravy of peanuts, sesame seeds, dry coconut) freezes well too. I also freeze rotis - two to a ziploc and freeze so he can just microwave them. For the dumplings, may be you can use ice cube trays/ new egg racks and cover with cling film - so they dont stick . Size might be a problem with icecube trays - have not tried this but just an idea off the top of my head. You can also buy dumpling trays which are stackable, on amazon. Satya- Interesting that the baingan dish freezes well, eggplant is my favorite vegetable and I'll have to try this! Rotis (and low carb tortillas in my case) do freeze well, it allows me to buy them in bulk and have them on hand. Thanks for all wonderful tips here! 3. Fire roasted baigan -for Bharit.